Have you ever had something in your closet that you no longer use, but still keep it? The situation with this bag was the same – it was hidden somewhere in the closet, waiting for its turn to comeback. 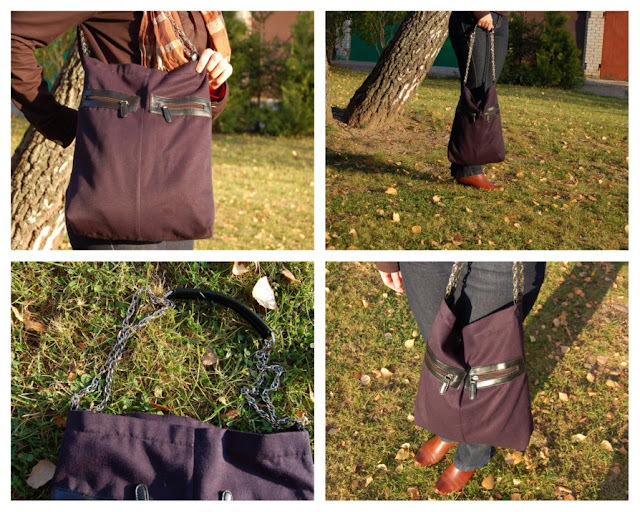 And then one day it came back… as a new bag! It wasn’t hidden in my closet, though. It was my cousins. Then one day I told her I make bags, and she generously gave me a bag filled with bags she no longer used. Oh, what a goldmine! You wonder why I was so happy? Old handbags are great for a couple of things: leather, hardware and decorative details that you can’t make at home. With leather it’s pretty obvious: you can use leather for a new bag or at least take leather scraps for your new craft project. When it comes to hardware - it can be hard to find sometimes, so it’s great when you find necessary parts somewhere in an old bag. And decorative details can whisper you an idea for a new bag. It happened with this bag too. When I first saw it, I knew exactly that the strap and pockets can’t go to waste! So I carefully removed them from the bag, took an old long navy blue skirt, made a simple tote from it, added some lining and finally attached the handle and pockets. And that’s it! It took less than an hour to make this bag, which costed me nothing! I love your bags! You are so clever, I've been hoarding a few of my old bags for some time now, once again you inspire me! Juliet, you always make me smile :) Thank you!